Discover the reason why Homer Simpson seems to have a new job every week. Then, power mad powerbroker Mr. Burns makes a power grab with his newest power-propelled product. And Marge is back on 'the beat' when she teams up with Chief Wiggum to find out why all the donuts in Springfield have gone missing! 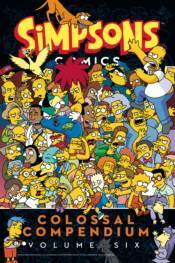 Throw in Lisa's bout of synesthesia, a McBain matinee, a rapturous event that leaves Ned Flanders behind, and Bart's bilingual battle with a pi�ata, and you have another comic cornucopia of colossal proportions. And music lovers, look no further for that shiny new saxomaphone or tubamaba with your very own paper construct of King Toot's Music Store.